we decided to fall in love. Maral and Brian met as colleagues at the U.S. Institute of Peace in Washington, DC. Brian even caught the eye of Maral's mom when her family hosted lunch one weekend for some of her friends and co-workers, when she said, "Maral-jan, who's that nice boy?" While Brian definitely noticed a little extra bounce in Maral's step whenever he was around, they did not start seeing each other until Brian left USIP and started school at George Washington University. Maral and Brian began seeing each other bit by bit. First, there was a little meet up here and there with friends. It progressed to taking detours from group hangouts and happy hours to take walks together through DC neighborhoods or along the National Mall. Then, it was finding time for an extra coffee break during the week. They knew there was a spark when they almost (almost!) kissed one night as Brian walked Maral back to her car. Needless to say, they needed some help. Brian talked to Greg...and Jeff...and Chris...and Kevin...about how he was falling fast for Maral. It was happening quickly and he didn't want to rush things. But there was definitely something different about her. Maral was smart and confident and relaxed and fun to be around - all of it in a way that made Brian feel like they had been together forever. Following several late night conversations and a lot of sage advice, he decided to give it a try. Maral talked to Alix...and Heidi...and Caitlin...and Sabina...about how she thought Brian might like her but she wasn't sure. The fear of crushing on a guy who may not reciprocate was real, and Maral came up with any excuse she could to not like him–like complaining about his cargo shorts. Her friends told her she was crazy to doubt Brian's feelings for her, and that cargo shorts was the weakest of excuses. It was their reassurances and Brian's increasingly evident nervousness around Maral that led her to accept that he was also crushing hard. 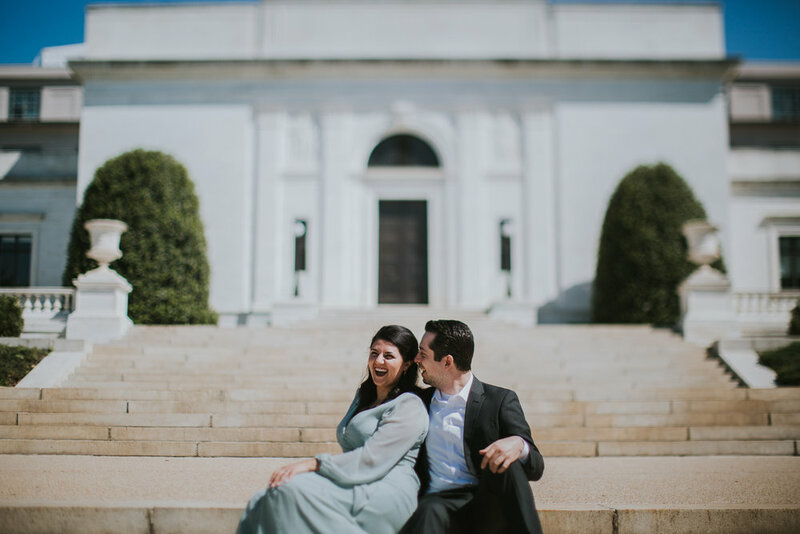 Everything culminated when Brian, who was CONVINCED that he set up the perfect first date–a tasting on a sailboat out on the Potomac with some friends–asked Maral to join him. The problem was that Maral didn't know it was a date! That's right. Brian neglected to mention to Maral in the first place that it was, in fact, a date. Despite the initial confusion, it became clear later in the evening when Brian worked up the courage to take Maral by the hand. They're happiest when they're just together - doing life things - running errands, working in Maral's vegetable garden, or spending lazy afternoons curled up on the couch. They're thankful for the love and support of their amazing families and friends, all of whom welcomed them with open arms. ...and they can't wait to get MARRIED! We love you all and we can't wait to have you join us as we celebrate our special day! The wedding ceremony will begin at 4 pm on Friday, November 10th of this year. The ceremony will be held at the Inn at the Old Silk Mill in Fredericksburg, VA, and promptly followed by a cocktail hour and reception. It is totally up to you if you plan to stay in Fredericksburg for the weekend, or do the short hour drive back up to DC. 1. We reserved a group block at the Courtyard Marriott in Downtown, an easy 15 minute walk to the venue, and even closer to all of the adorable stores and delicious restaurants and bars. The block is for both the 9th and 10th, and is rated at $179 a night. 2. Maral loves to stay at AirBnBs whenever she gets the chance. If you are up for an adventure--not really, it's pretty laid back--then book an AirBnB! All we want from you is to join us on this special day, ready to DANCE. But, if you must gift us (which you don't) we have started a registry on Zola. We are also accepting United miles, grocery store coupons, and your go-to financial advice. Are you RSVPing for anyone else? If so, please list their first and last name below. What songs would get you out on the dance floor? Do you or your guest have any dietary restrictions we should be aware of? Please feel free to get in touch with us directly if you have any questions!